Loren Rhoads doesn’t find cemeteries depressing or spooky. Like many preservationists, she loves the contemplative feeling she gets amid the quiet beauty of a historic graveyard. In 2011, she began documenting her cemetery visits on her blog, Cemetery Travel. Now she’s come out with a new book, 199 Cemeteries to See Before You Die, from Black Dog & Leventhal Publishers. It highlights big names such as Green-Wood Cemetery in Brooklyn, New York, and Arlington National Cemetery, as well as smaller gems like the Granary Burying Ground in Boston (shown at top) and the churchyard at San Esteban del Rey church at Acoma Sky City, a National Trust Historic Site in New Mexico. Below are some excerpts from our recent conversation with Rhoads, as well as a few photos from the book. How did you become interested in cemeteries? I grew up in Michigan down the road from a little farm cemetery where [some of my family members] are buried. When we were kids, my mom took my brother and me down to this little cemetery and we made gravestone rubbings. I saw names I recognized. Some of the streets around there are named after people who are now buried in the graveyard. It was my first inkling that history informs where we are now. I think I was 10. But traveling to visit cemeteries [happened] completely by accident. My husband and I were going to Europe for the first time and the First Gulf War started as we were in transit, so we kept missing connections. We ended up in London, where we hadn’t intended to go. We bought a book of cemeteries in a gift shop, and we [decided to go to] Highgate Cemetery. It was just exquisite. It’s one of those places that was all but abandoned in the 1970s. A “friends of the cemetery” group formed to take it over, and all these years later they still run it. They have done amazing amounts of work. 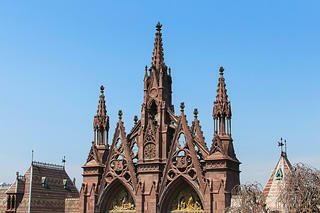 The upper section of the Gothic Revival archway at the entrance to Green-Wood Cemetery in Brooklyn, New York. Swan Point Cemetery in Rhode Island is maybe the most beautiful cemetery I’ve ever seen. I was there in the spring years and years ago, and there was this enormous weeping cherry tree. But the rest of them shift around in ranking for me. Highgate has a special place in my heart because that’s where I started. Last summer we went to Poblenou in Barcelona, and it was really pretty in an overly Gothic, Mediterranean way. I think my favorite is whatever one I’m standing in at the time. What in particular appeals to you about cemeteries? The thing that I like best in cemeteries is the statuary. I will hike for miles across a field to look at it. There’s some breathtaking statuary in cemeteries—one-of-a-kind, museum-quality stuff that’s out there in the elements for anyone who wants to take a look at it. The [other] thing that keeps drawing me back is the sense of peace. 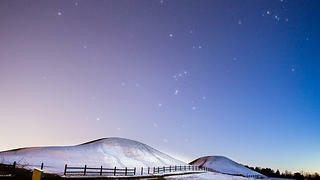 The Royal Grave Mounds in Gamla Uppsala, Sweden, are thought to have been built more than a thousand years ago. Which cemetery has the most interesting history? Mount Auburn in Cambridge, Massachusetts. Mount Auburn was the first in this country where the forefathers of the cemetery bought a beautiful piece of land to preserve its beauty and set it up as a cemetery. [They envisioned it] as a teaching landscape, so that people could come and think about nature and the cycles of nature, and how beautiful it was there, and kind of reconceive heaven. Instead of death being a place you were afraid of, it would be this beautiful place where anyone would want to go. Any individual graves you were excited about visiting? In my other life, I write science fiction. A couple of years ago we were in Los Angeles and I found Ray Bradbury’s grave. I met him once in life and he was very kind. It meant a lot to be able to stand over his grave and thank him. I’m about to go off on my book tour, and one of the places I want to stop along the way is Carrie Fisher’s grave, because she was another inspiration to me. 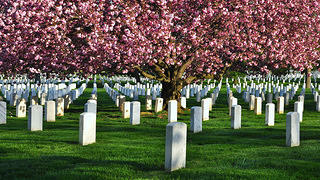 Arlington National Cemetery in Arlington, Virginia, is open 365 days a year. I wanted to underline how fragile cemeteries are. Two [that I covered] in the book, Tolomato Cemetery and the Huguenot Cemetery, both in St. Augustine, Florida, suffered damage in Hurricane Irma. Both have friends group that are overseeing them and helping to do the restoration, but they are in rough shape. Cemeteries need people to step up and take care of them. That’s kind of my whole point with the book, is that people take care of the things they love and unless they visit cemeteries, they won’t know what they’re missing. 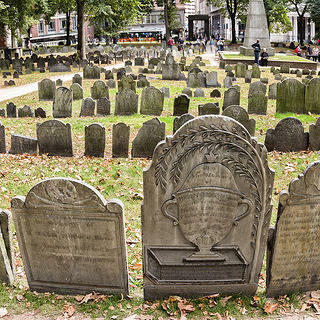 Present in nearly every community, cemeteries and burial grounds offer a fascinating glimpse into America's cultural history. Learn how best to protect them. At historic Congressional Cemetery, you can ponder the mysteries of death, but you'll quickly be awed by something else: the presence of the living.